i got back out on the garage sale circuit with my friend nikki this weekend for the first time since early spring (actually, my last garage sale, was our own) and had a bit of success. plus the weather was overcast and drizzly so we werent sweaty monsters (the exact condition i have tried to avoid by not saling all summer). 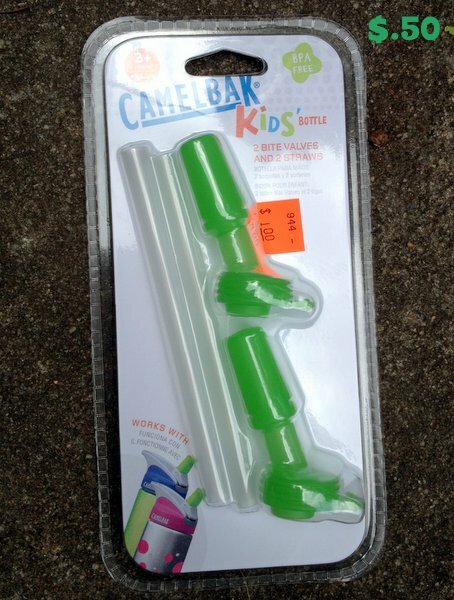 2 brand new, unopened sets of replacement straws and valves for camelbak kids bottles...which we have two of! this was at an estate sale where we walked through all the rooms in the house and all the stuff for sale was spread throughout.everything was 50% off by saturday so we got this $7 set for 50 cents. 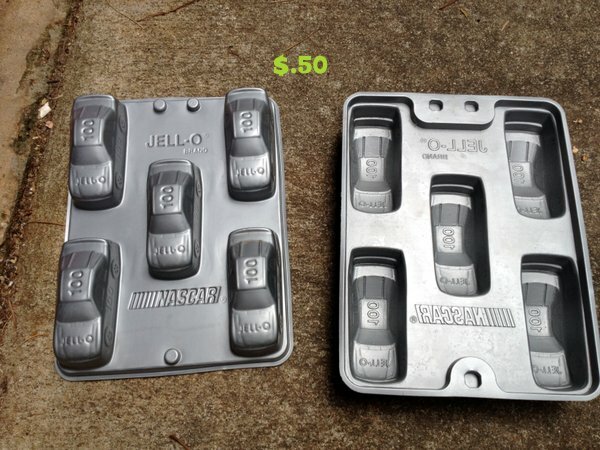 2 sets of racecar jello molds. these people appeared to be big jello-molding fans, with lots of these for sale, but i'm no jellist and only got the cars to use to make fun shaped crayons for a rainy day project or goody bags. some pretty and reversible wrapping paper and a yard of a kind of fabric i had JUST been needing the night before for a little layla project that i had to postpone because i didnt have the right stuff. perfect! 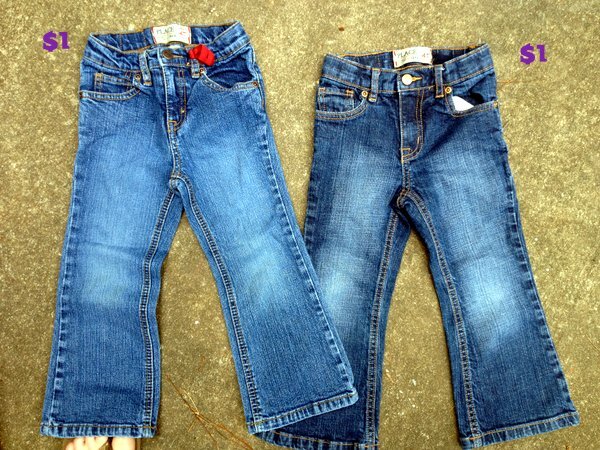 $2 for two pairs of children's place jeans for layla. they are in great condition. i tried NOT to buy this because there was some eastern european woman working this sale (for no obvious reason such as residence or relation to the house) and she was REALLY pushy and aggressive. 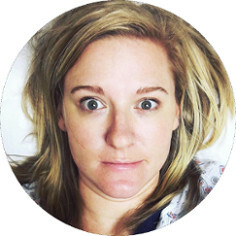 but bootcut and adjustable waists won me over and i hid in the car while nikki finished looking. so $3.25 for several things i had actually said i needed before, KNOW i will use, and just one fun thing i never knew i wanted until i saw it (jellos). i was not looking for this, but sometimes an item just jumps into your heart and hands. 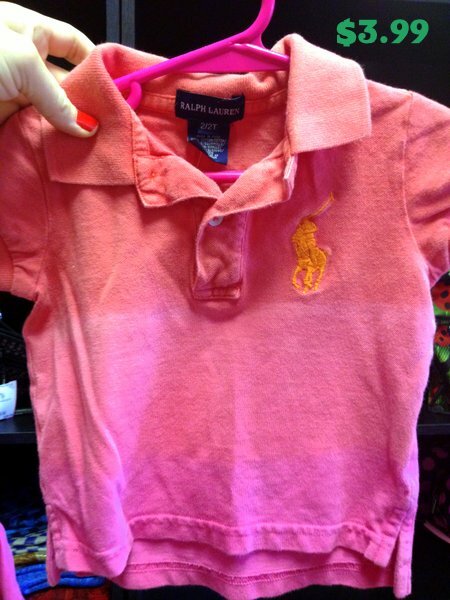 this is a big horsey little girl's ombre polo shirt for my tiny friend hazel, whose daddy, ryan, rocks the big equine shirts like it's his job. 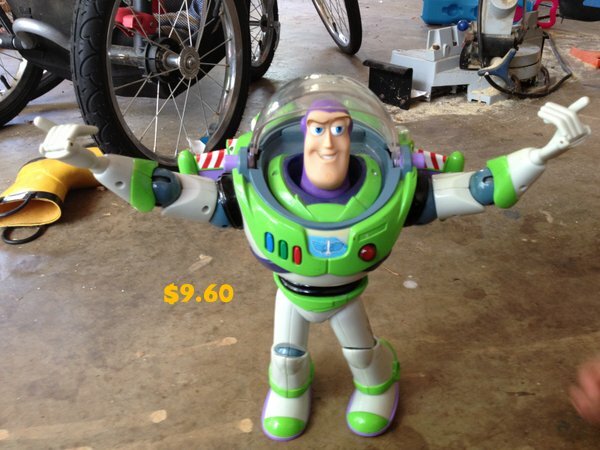 okay, no, $10 for a buzz lightyear action figure is NOT good. but this isnt just any buzz. it's the kind judah has been coveting for almost a year and which i have been terrified by the retail price of. did i mention he is huge and and talks? and he wants you to bring it! 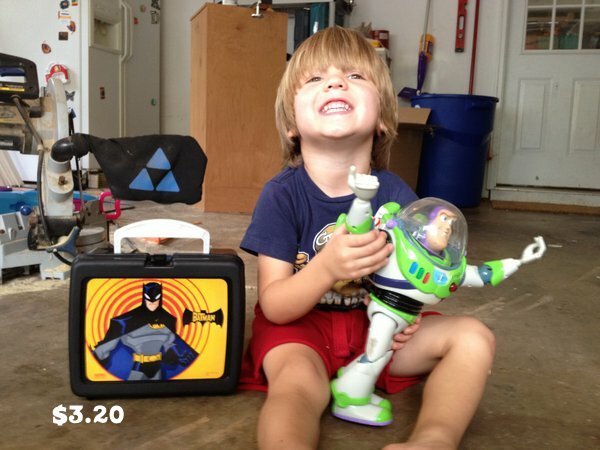 and a new (used) lunchbox was on the back to school list anyway. score one for mommy and one for BATMAING! i had this exact style helmet in my amazon shopping cart this week for $25, since layla outgrew her baby helmet and we've been taking lots of bike rides to the library and town lately. SO glad i didnt buy it since i found the same model for $3. 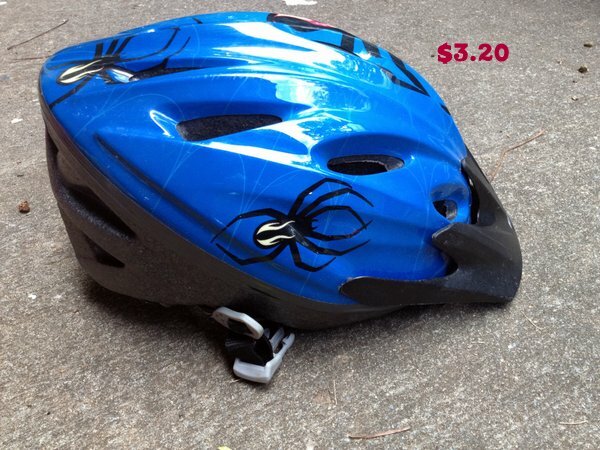 judah will wear this one and think its spider man and layla can have his less overtly-boyish one. brain safety for the win! 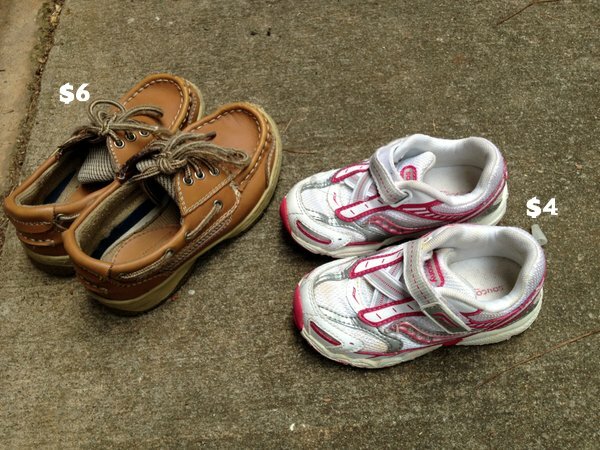 a pair of saucony kids shoes for layla which was also on the back to school list (no sandal allowed at school...oh, my poor heart). and a pair of sperry-esque dressy shoes for my little preppster boy. oh judah. this kids has become the weirdest little magpie hoarder. i find caches toys in the weirdest places hidden all over the house lately. he's very into lots of things inside of other things. so obviously, this is something i want to encourage so that he will have a future reality TV career on TLC one day. 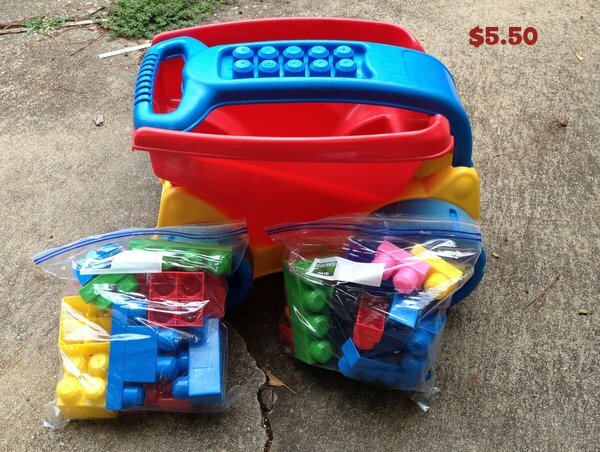 thus this mega bloks set and wagon for building, stowing and hauling around outside. $30 new, so i feel okay with this. and this last item should have been charged to my friend nikki, because i was already done shopping when i spotted it. she was taking 8 years to check out and i saw this dress on a mannequin and loved the style for a few wedding i have coming up. i checked the size and was crestfallen that it was a small. in desperation, i gave the mannequin a hug to compare our waists and then tugged on the jersey material to check the stretchy-forgiveness factor. i thought it was worth a try so i [very] unceremoniously climbed up in the window, ripped the arms off the mannequin, stripped her and accidentally toppled her wig as well so that i could try on this little number. it turned out to be worth it because it totally fit. i read somewhere fancy that mullet hems are in! i'm all for trends that allow me to bend over with coverage-confidence. 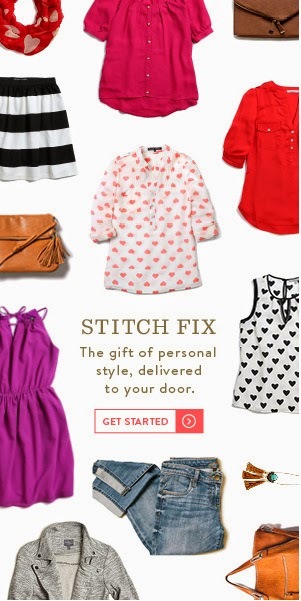 we'll see if stitch fix can beat this! so the consignment shop kind of killed my super-steal total for the day, but i am pleased with the haul since many of these were already on my radar and wishlist. what is your favorite garage sale season? do you have any great consignment shops youre faithful too? 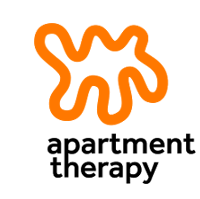 are we spoiled little garage salers to think that consignment prices are often too expensive? did any of yall score any deals this weekend? we have that buzz!! It broke after 1 week because little man is a bit rough. He still loves it, though. And the dress is fab. Late to the game on this comment, but dude, well done! Your scores epitomize so many of the categories that keep me coming back to garage sales again and again: the thing you can totally use but never would have thought of (camelbak), the thing on your list for way cheaper (fabric, helmet, shoes), the thing you can always use especially at a great price (jeans for Layla), the quirky thing that's fun and just cheap enough to go for it (jello mold), and best of all, the toys your kids will love that you'd have never paid full price for (Buzz + dump truck). I say best of all because if you're like me and NEVER buy your kids toys at an actual store except for birthdays and Christmas, it makes you feel like a great parent for actually getting them what they really wanted. :D I recently found Annabel a brand new Rapunzel Disney Princess Barbie for $1 that is now her favorite. Yesss. 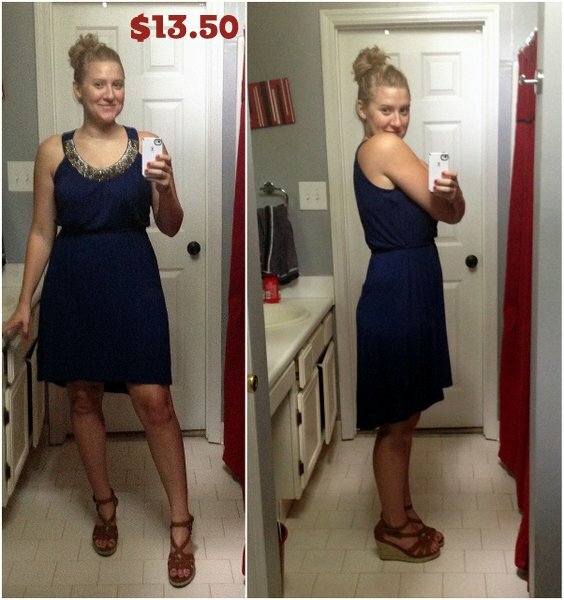 Oh...and...that dress is HOTT and at a fabulous price. 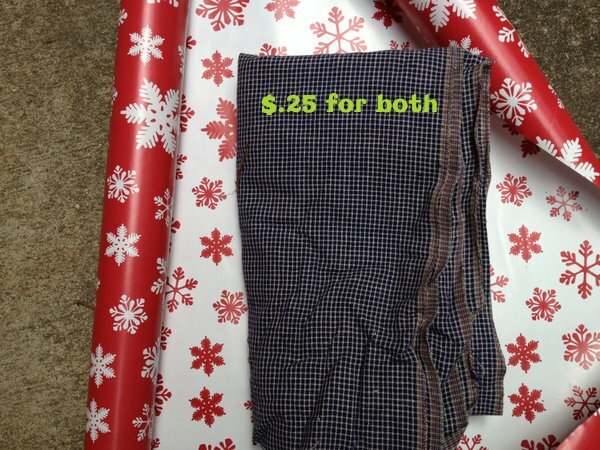 Seriously, that's a decent price even if you'd found it at a thrift store. Nice score! Props for your audacity in wrestling it off the mannequin. I would not have had the guts.